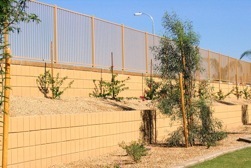 In the mid 1990’s Proto-II™ Wall Systems expanded from masonry fencing and introduced the Proto-II™ Retaining Walls. 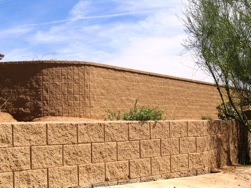 The Proto-II™ Retaining Walls use the same post tension technology as the original Proto-II™ Fence Walls and yield the same advantages and more. Because Proto-II™ Retaining Walls are post tensioned they require no grout, no grout inspections and no waiting time for grout to cure. Proto-II™ Retaining Walls can be backfilled immediately after tensioning, reducing up to a 30 day wait time. The absence of grout also significantly reduces the cost of labor and materials. 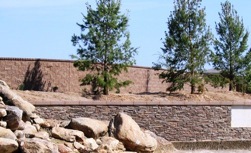 With increased strengths, reduced installation time and significant savings, Proto-II™ Retaining Walls have become an excellent alternative to conventional retaining walls.